While Matteo Guidicelli is ready to do sexier scenes in his newest project Precious Hearts Romance: Isla, he says girlfriend Maja Salvador has no reason to be jealous. After training for a recently concluded triathlon, Matteo Guidicelli has been sporting a leaner and tanner look which suits him well, especially since he is currently shooting scenes for his upcoming series Precious Hearts Romance: Isla with Jessy Mendiola in the Caramoan islands in Camarines Sur. “Hindi ko naman iniisip yung weight ko eh basta train lang ako ng train. Basically it took three months to prepare for this soap. Sa physical side and also sa workshops sa aming director and everything,” he shared during the Promil Pre-school i-Shine Talent Camp presscon where he is a host along with Xian Lim and Dimples Romana. The talented actor admitted that he is looking forward to being paired with Jessy Mendiola for the first time. “Ayos. Jessy is very, very fun to work with. She’s very nice to be with. She’s a very sensitive person. I’m taking this as a very, very fresh, new challenge and I’m very excited,” he said. Matteo said that he will be showing off a sexier image because it is a PHR series. “Basically it’s a romance. Basically it’s a new me. Basta alam natin na yung PHR romance so talagang makikita natin na maraming romance (laughs). Basta just imagine two people on an island. Only two people in an island na walang kasama. Parang Blue Lagoon. Isa ako dito from a rich family na married ako dito na businessman na 25 years old and basically I get stranded on an island with a girl I don’t know,” he shared. When asked if he will bare more skin in the series, Matteo said he is ready to do it if the story calls for it. “Okay lang kasi ginawa na namin yan sa Agua Bendita so exciting if we do that again. Whatever the script requires ‘di ba? But siyempre I have to always ask advice from my parents about all this stuff. My parents are always there. They give the last decision. They advise me with everything,” he admitted. The 22-year-old actor also admitted that everything in his personal life is going great, especially his relationship with Maja Salvador. Matteo said he is not worried that there might be any issues with doing kissing scenes with his Jessy. “Ah hindi na kasi alam naman talaga niya kung ano ang trabaho at ano ang hindi. Ang promise ko naman sa kanya is I will be professional here and I will give 100% and just do my best here in this show. This is an opportunity that ABS-CBN gave me na lead talaga ako sa isang soap so I’m very, very excited. I think this is it,” he shared. Matteo also shared the secret to his strong relationship. “Siyempre sa isang relasyon may mga tampu-tampuhan o away pero that’s normal but we get through it We keep everything separate: our work and our relationship. So it’s very, very important to keep that separate. Just trust and communicate a lot,” he added. Even though Maja recently won the best actress award at the Gawad Urian, Matteo does not feel pressured about his girlfriend’s accomplishment. “Wala naman. I don’t think about that. If that comes, it comes. It’s a big blessing, but I just want to give my best and do different things,” he said. Matteo said that even though he is also currently hosting the new kiddie show Promil Preschool i-Shine Talent Camp, it does not clash with his mature image in PHR. “I just want to show that I can do different stuff. I would also love to do an indie film. Wala pa pero sana. I would love to do one,” he said. Catch Matteo Guidicelli on Promil Pre-school i-Shine Talent Camp every Saturday, 9:30 am on ABS-CBN. 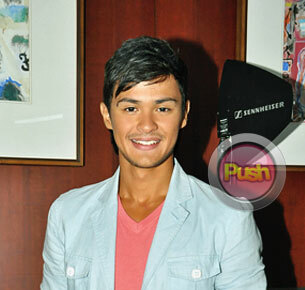 For more updates on Matteo, log on daily to Push.com.ph and follow @Push_Mina on Twitter.